When it was decided that we would try to do a presentation of our project And All the Questionmarks Started to Singin Kolkata, India -we first had to find a venue. The following search for a suitable place soon got beyond theatres and stages and into “any kind of large space”. By the good help of the Norwegian consulate in Kolkata we went through all possible kinds of promising sites in the city for several weeks. Everything from huge palaces to industrial halls, but ther were allways something that blocked the possibility. Finally we received some photos of The Currency Building. The possible space was the inner courtyard of this huge building. We studied the photos here in Oslo, it looked interesting, and we decided to go for it. A good choice -but not very easy practically. To begin we should take a short history of The Currency Building, located in the very centre of Calcutta: The building was originally The Reserve Bank Of India. It was also production of old British silver coins and money in the building for a long time. This 178-year-old building in Dalhousie Square (overlooking Lal Dighi) has also been giving the Kolkata chapter of the Archaeological Survey of India sleepless nights. The building, after passing through several hands including the British government — which set up its currency office here — was to be pulled down nearly a decade ago. As a result, part of its structure, including two huge domes with strong Italian architectural influence, were pulled down. Images of the structures are not available, leaving the restoration process in a soup. In 2000, the Central Public Works Department, which was in charge of the building, decided to demolish it and construct a 14-storey highrise for its offices. Work had started and 25-40 per cent of the building was pulled down by those who had taken the tender. However, after protests from non-government bodies and the governor’s intervention, the building was handed over to the ASI in 2002. It had then become a jungle inside the outer walls. A ruin. “It took us two years just to clear the debris from the demolition work,” said T J Baidya, superintending archaeologist, ASI, Kolkata. 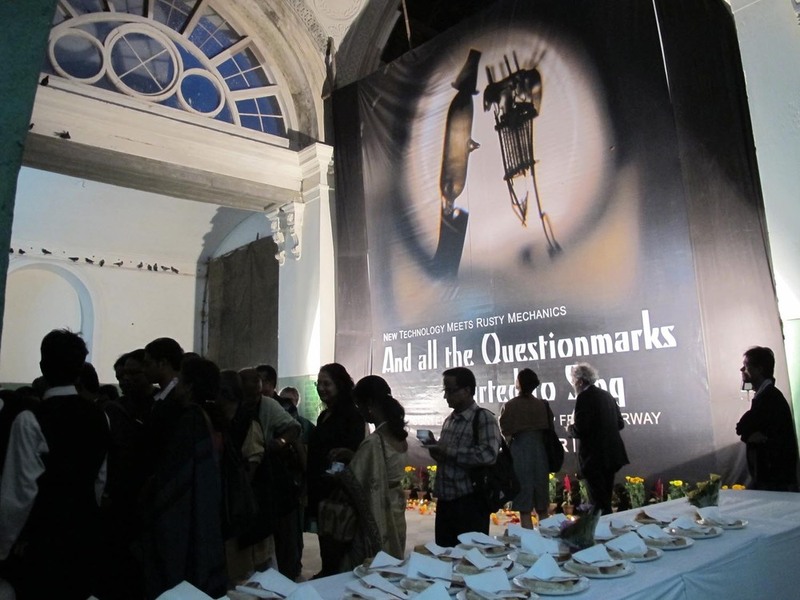 This is the first time the Archaeological Survey of India gives permission to use the stately Currency Building to be opened to the public for an audio-visual performance of this scale. The building, now on the list of Centrally Protected Monuments in Kolkata, still requires some years more to be restored completely. This information was new to us when we arrived in Kolkata. Our surprise was great when we went there and saw the great columns and arches – but the domes over the courtyard was not there, above it was nothing but the sky. Then we started to work. By the help of our local practical producers, the theatre organisation Padatik, we got in contact with a group of experts on large bamboo structures. They made an incredibly nice and strong bamboo structure covering the whole inner courtyard of the building. (25 x 20 m + 12 m high). In this way we managed to make our own venue for our piece. After we had got a roof over the courtyard we spent the following days to set up our kinetic sculptures, sound system, light, video and all kinds of equipment for the total electromechanical installation and scenery. Well, the result of all this work was the coolest venue we ever played in. Even all the traffic noise that came in through the east side of our cotton wall blended nicely into our performance. (The original wall on this side was gone and it was open space right into the frenetic traffic in RD Mukherjee Road). During our long stay in Kolkata we also collected a lot of possible material for coming projects. On our many long walks around the city we recorded sounds and video or we just looked and listened to the crazy chaos of this big and rough city. When we got lost it was always possible to ride in the tsunami of yellow cabs, or take one of the “trams from hell” back to our residency at Chowdhury Guest House on Chowringhee Road.